"It's become a very, very profitable market and is here to stay," said Elie Bursztein from Google who, along with colleagues Kylie McRoberts and Luca Invernizzi, carried out the research. As well as drawing on reports from people who had paid a ransom, it sought out the files used to infect machines and then ran those on lots of virtual machines to generate "synthetic victims", he said. The research project also revealed where the cash flowed and accumulated in the Bitcoin network and where it was converted back into cash. 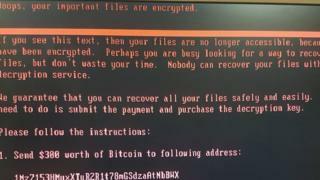 More than 95% of Bitcoin payments for ransomware were cashed out via Russia's BTC-e exchange, found Google. "Ransomware is a fast-moving market," he said. "There's aggressive competition coming from variants such as SamSam and Spora." "It's no longer a game reserved for tech-savvy criminals," he said. "It's for almost anyone." Video How easy is it to hack a cash machine?